Occupation: Mello is a former resident of the Wammy House who later joined the mafia to catch Kira. Mello is the older of L's two successors raised in Wammy's House, Watari's orphanage for gifted children, in Winchester, England, United Kingdom. When it is decided that Mello should work with the other successor, Near, Mello refuses, citing an inability to work with Near, to whom he is considered second. 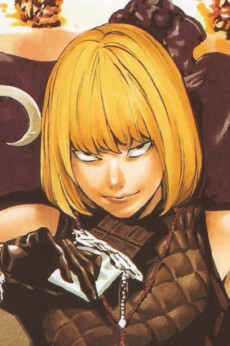 Similar to L's fondness for sweets, Mello is often seen eating bars of chocolate. How to Read 13 states that Mello has "an excellent mind" and that he "sometimes lets his emotions get in his way." The book cites Mello's "hatred of Near," which created "a flaw in [Mello's] personality." The book states that Mello isn't purely evil, citing his apology and genuine care for Matt's well-being. Tsugumi Ohba, the writer of Death Note, stated that Mello "works hard for everything." Ohba added that Mello's name "doesn't really stand for anything," as opposed to Near's name standing for Nate River, etc. Mello is voiced by Nozomu Sasaki in the Japanese anime, David Hurtwitz in the English version and Javier Olguín in the Latin Spanish dub. Mello decides to find Kira his own way by joining the Mafia. After obtaining one of the Death Notes from the Kira investigation team by kidnapping Sayu Yagami, Light Yagami sets up a raid that leaves Mello badly scarred and his real name in Light's hands. After learning that Light is Kira and Near was going to attempt to apprehend him, Mello kidnaps Kiyomi Takada, but is soon killed by Takada's hidden pages of the Death Note. This action causes Teru Mikami to expose his own Death Note to kill Takada, an action that Near picks up on and is eventually able to use to thwart Light's plans. Near reflects this during the final showdown and credits Mello as the single most pivotal person in discovering Light's plans. Hal Lidner further believes that it was Mello's plan that he would be killed to expose Light's plan, but Near rejects this theory. His date of death is January 26th, 2010. Age 20. Mello is the narrator of the spinoff novel Death Note - Another Note: The Los Angeles BB Murder Cases.